Accelerated Reader (AR): The AR program provides an excellent opportunity for teachers to monitor students’ independent reading progress and encourage the development of lifelong reading habits. Using the AR technology, teachers and students work together to set personalized goals that will challenge each student at just the right level. Students gain points based on books they read, and teachers can keep tabs on each student’s vocabulary growth, literacy skills development, and reading comprehension. Band, Choir, and Orchestra: If your child will attend Snowflake Intermediate for fifth or sixth grade in the 2018-2019 school year, he or she will have the opportunity to participate in choir, band, or orchestra during the school day. The school district has hired another music teacher and in doing so has created the opportunity to work with the fifth and sixth grade students. These classes will take place on Monday and Wednesday. Orchestra will take place in the music room here on SI campus. We will walk the band and choir students to the HS band and choir rooms. If your child is currently in band or orchestra, please inform the office so that we will be sure to put that as a first choice as there is no longer after school band or orchestra. If you are a visitor to our website and will be registering a fifth or sixth grade student at Snowflake Intermediate, please be sure to ask for a paper to register your child with his or her choice. This opportunity is only for those students who will be in fifth and sixth grade. Beyond Textbooks: More than just a program, Beyond Textbooks is a philosophy and framework for education that empowers teachers to transcend the limits of traditional textbooks in order to enhance the learning process. Our teachers have the opportunity to collaborate with teachers across the state to create an optimal educational experience for the students in their care. During and After-School Tutoring: Whether your student just needs a quick catch-up session or a more long-term tutoring arrangement, we have the resources to help. Our tutoring program helps us ensure that every student continues to progress and that no one gets left behind. PAWS: This acronym, which stands for Pride, Attitude, Willingness, and Success, represents a way for us to encourage our students to develop attributes of success. 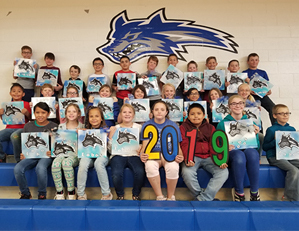 Each month we focus on a different character trait, and at the end of the month we hold an assembly honoring students from each class who have exemplified that trait.